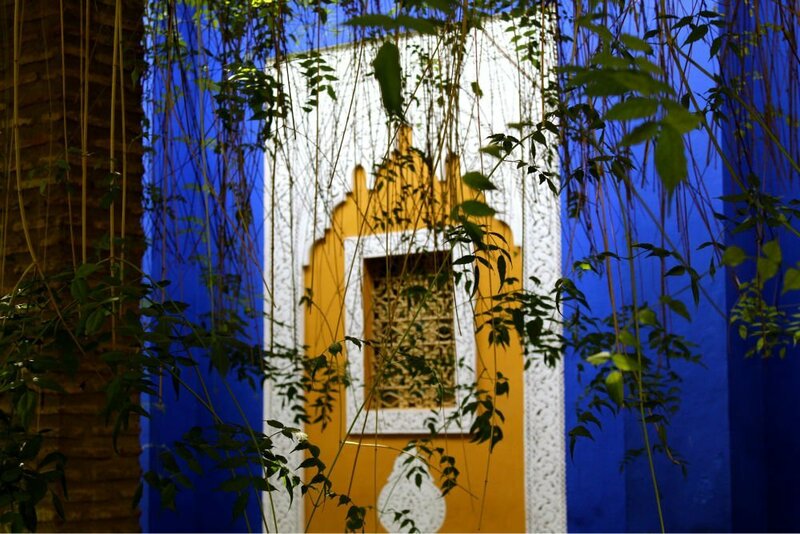 Jardin Majorelle – Blue oasis in Marrakech. In hindsight, it is a bad idea to visit the Jardin Majorelle on a Saturday morning during high season in Marrakech. But then again, everything is bound to be just as crowded with Marrakech straw hat wearing tourists (just in case you forget where you are!) and at least crowded shadow is better than no shadow. If I was worried I wouldn’t be getting enough sun in early May in Marrakech, I shouldn’t have been; it is now 10.30am and the taxi driver proudly tells me that we are suffering in 40°. Then he calls me a Marrakeshia, which is far from the truth, but makes me happy nonetheless and earns him a big tip. While I have only been once, back when I still really disliked Marrakech – yes, such a time existed – Jardin Majorelle is one of my favorite places in the city. Maybe because it is away from the crazy medina, literally and figuratively, but I immediately liked it. And now I realized that I can love both – the crazy and the calm, the sand colored and the lush & the blue. And while the main plants that you will see here are cacti and palms, it is incredibly lush also thanks to color bursts of Majorelle Bleu walls, vibrant mustard yellow ornaments, orange goldfish and magenta bougainvillaeas. Of course, I not only love it because it is a dream come true for anyone with a nerdy affinity to botanic macro shots – et voila, c’est moi! – but also because of him. The visage of Yves Saint Laurent is at times the only man allowed to sleep next to me so, of course, this is my perfect place to pay homage to him. I am delighted and a bit starstruck when I watch two men in the library store rearranging pictures on the wall who look like they could be his children. I might be thrown off by the hipster glasses, which today are actually way too common to indicate a relation to Yves Saint Laurent, but still. Luckily my French doesn’t get me any further than Pardon, vous etes les… I cannot think of any polite French phrase for illegitimate children. To ask whether they are nephews doesn’t occur to me, not that I would have known the word for nephew in French either. So I don’t say a thing and just continue staring, in a what I think is an inconspicuous way, and buy more postcards that I bargained for. The garden is as lovely as I remembered but very very crowded. There is no sitting on a bench, contemplating life and what Yves would think of the current Saint Laurent collection instead there is waiting for photo ops and a lot of inappropriately dressed people. While it would be nice if everybody dressed for the occasion when visiting Jardin Majorelle, after all, this is like a UNESCO World Heritage for fashion lovers, surely it is not too much to ask for to wear more than tiny shorts. Girls, we are in Morocco, so shorts and tank tops are just not appropriate. If you chose to forgo basic decency please don’t add insult to injury by wearing shorts that look like you have wrapped yourself in layers of toilet paper. After all the fashion god is right here, ready to turn in his grave, which by the way you are here to visit. You can actually buy Majorelle Bleu paint at the shop. What a gorgeous color – any good ideas what I could paint so I have an excuse to get some?! Bamboo forest, reminder of Chiang Mai forest trek, luckily not as hot and my water bottle still full. 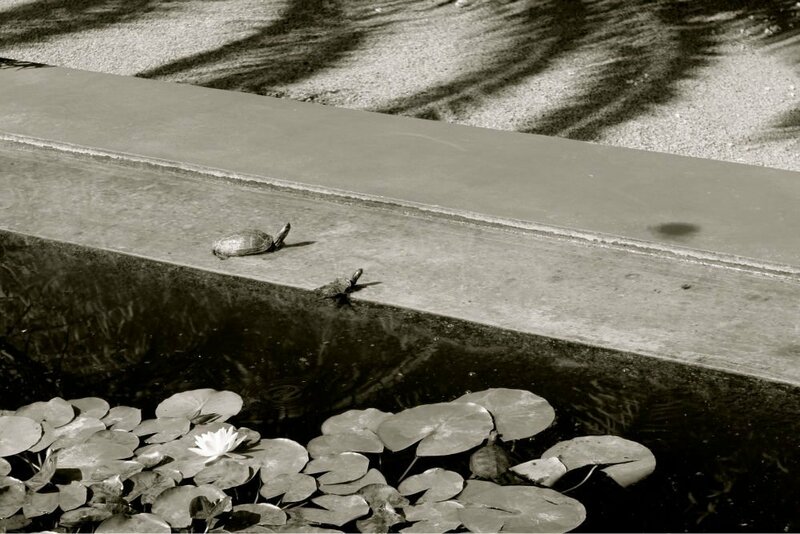 Little sun worshippers. I should be sitting next to them. The garden is open every day, so don’t fall the scam of taxi drivers or other ‘helpful’ guides who want to tell you different (in order to take you to their cousin’s shop!). And don’t go on Saturday if you can avoid it! Do visit the Berber Museum inside the garden, it is beautifully curated by Pierre Bergé, Yves Saint Laurent’s life partner. They don’t allow photos inside, but it is well worth a visit. Get a ticket at the main entrance. Visit 33 Rue Majorelle afterwards, an awesome concept store just across the street. For everything that art and fashion lovers may need (or just really really want). There is a Petit Taxi stand outside the garden. They charge a bit more, allegedly to make up for parking fees. But while they won’t turn on the meter, you can still negotiate your fare. Thank you for mentioning the shorts…..I thought I might be the only one who saw it as completely absurd. Pockets longer than the shorts…come on people. Absolutely not! And this time I see more than ever. Mind you, a lot are so short that I would raise my eyebrows seeing them in Germany. I really just find it so disrespectful and just because nobody is going to arrest you for wearing them, isn’t good enough reason that you should.